Numerous artists, cartoonists and scriptwriters have in their works depicted the seafaring world in all kinds of publications: albums, magazines, comic-books, graphic novels and so on. Comics dealing with stories that are universal have gradually gone beyond geographical borders to achieve worldwide recognition. 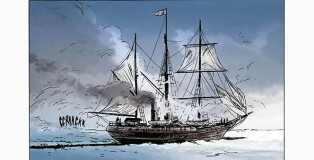 In “A sea of comics” will recommend various publications and authors associated to the maritime universe.